In second half of the twentieth century, Parisian-Breton intelligentsia adopted the harp’s Irish history as part of a Pan-Celtic revival, and a symbol of resistance. The Irish had had to burn their harps when the English invaded, and he who kept his harp did so in peril of his life. The harp was reborn among the Bretons in Paris as a symbol of resistance against the ever-centralizing French state. The lever harp had also been gaining popularity in Brittany itself since the nineteenth century, thanks to visiting harpists from other Celtic lands. In the 1970s, France experienced a coinciding folk revival, coming from the USA via Great Britain. It became clear that market demand increasingly required domestic mass production, in addition to the work of smaller artisans, and many importers. Part of the Celtic/folk revival was a craze for South American music., and Gérard Garnier decided to begin making American Indian flutes. Their success surpassed all expectations. Gérard therefore suggested to his elder brother Joël that he assist him in taking the commercial hand of the business. During the winter of 1971-72, they founded the Camac Society in a large hangar in Mouzeil, near Nantes in Brittany, where the Camac factory still is today. Camac’s name comes from “Pachacamac”, an important Quechua god. His name means “creator, giver of life”. Camac began to expand its production to appeal more widely to the folk music movement. As well as Indian flutes, they made hurdy gurdies, Vosges spinets, Scottish bagpipes, dulcimers, bombardes and Breton bagpipes. Following the success of Alan Stivell and his “Renaissance of the Lever Harp”, Gérard and Joël Garnier began to interest themselves in this instrument. At first, going into production was out of the question, and they imported lever harps from a Japanese manufacturer, at the time the only manufacturer capable of lever harp production on this scale. In 1972, the first Camac harp model was offered for sale, the “Bardique”: an instrument with a plane-parallel sound box. Alan Stivell used one of these instruments on-stage. Camac’s first “Celtic” harp appeared in 1976. This instrument was intended to echo what was long called the ‘Irish’ harp: a plywood model with 32 strings, developed with the advisory help of Mariannig Larc’hantec, one of the pioneers of the instrument in Brittany and, like so many, Telenn Bleimor-trained. After the Morgane, Camac soon added the first Mélusine models to the lever harp range, plus a now-discontinued model called the Brocéliande. Within a few years, Camac had come to occupy more than 95% of the Breton Celtic harp market. The 1970s saw the rise of the folk-rock movement, and amplifying the harp therefore became essential. The group that accompanied Alan Stivell included electric guitars, drums, pipes and the bombarde – none of which are soft instruments. The use of external microphones rapidly proved to be doomed to failure. The amplification could not technically be confined to the harp, and the other instruments around were forcibly also captured. Moreover, even at quite a low volume level, feedback hugely complicated the task of sound engineers. The idea hence followed of putting a microphone directly in the sound box, which gave a more precise result. The Salvi firm should be acknowledged for their development of the first amplified pedal harp; equally notable is the amplification research carried out by individual harpists, especially Andreas Vollenweider. After some years, and despite certain advances in electroacoustic harps, feedback and external noises still occurred too often, according to the placing of pick-ups in the harp, or the configuration of speakers on the stage. So Joël Garnier decided to create a harp that didn’t have any sound box at all. Camac’s “solid-body” harp had neither a sound box nor soundboard, and equipped with a piezoelectric microphone on each string. This type of pickup is very different from a magnetic microphone, and Camac uses it to this day because of its pure, natural and round sound. Joël Garnier and Kristen Noguès presented the “ElectroHarp” at the Edinburgh International Harp Festival, and then the World Harp Congress in Jerusalem. Alan Stivell plays it on “Harpes du Nouvel Age”, and around the same time it was adopted with well-known success by the well-known Scottish harpists Patsy Seddon and Mary MacMaster. Camac received more and more requests from harpists for pedal harps. Spotting a promising market, Joël Garnier first responded to demand by offering for sale American harps from Chicago, as well as the Russian harps made in St Petersburg. Later, he progressed to manufacturing his own classical harps. One can easily imagine the implications of this for a harpist in concert, as well as for the teaching of the instrument. But without doubt Joël Garnier, who still did not really know the harp world, wanted to go too far, too fast. The project was destined for a short life: what Jakez François has described as the “Concorde of the harp” was a Concorde that was never to take flight. Presented in Jerusalem at the 1985 World Harp Congress, the prototype, its budget run into millions of francs, was a sensation. But after all is said and done, it proved commercially unworkable. If it displayed undeniable technical prowess, it was nevertheless insufficiently reliable, and the cost of its manufacture was exorbitant. The technology on board also made the base of the instrument considerably heavier, harder to transport, and to use. Camac have therefore donated this instrument to the Musée de la Musique in Paris, where it can be found in the “Instruments of the Twentieth Century” section. Clearly, the Memory Harp was not destined to replace traditional pedal harps. Camac’s first double-action harp range featured just one innovation: a metal core to the column. This is an idea taken from Pleyel, and is a principle Camac still follows today. The metal core has now been replaced with carbon fibre, lighter and even more stable than metal, clad with wood. At the Vienna World Harp Congress, Camac were very proud to exhibit the first pedal harps made in France since the time of Sébastien Érard. A most inventive technician, Joël Garnier had never been a musician. Camac would certainly never have become what it is today had he not discovered his alter-ego in Jakez François. Jakez came from a family of Breton traditional musicians, and studied both Celtic and classical harp. Jakez François joined Camac as a technician, regulating the classical harps before they left the Camac workshops. 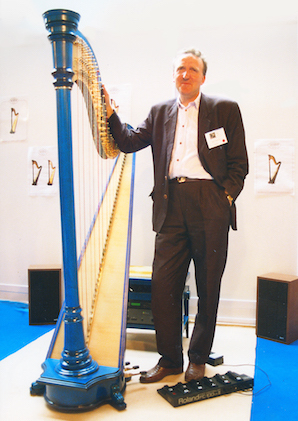 Jakez also collaborated with Joël Garnier in developing Camac’s new harps, like the Blue Harp in 1990, and the famous “New Generation” concert harps between 1991 and 1995. It was a perfect partnership. Joël Garnier concentrated on technical innovation; Jakez François, trained musician, was chiefly interested in sound. Jakez was steadily promoted in the Mouzeil firm, becoming the principal businessman next to Joël Garnier. 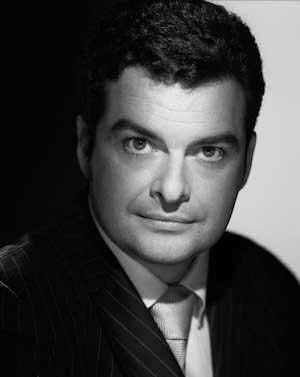 After becoming General Director of Camac, he succeeded Joël Garnier as the overall President of the company, after Joël died on September 11, 2000. Some harpists had told Joël Garnier of their desire for an electric pedal harp, which could offer them the same possibilities as the electric lever harp. 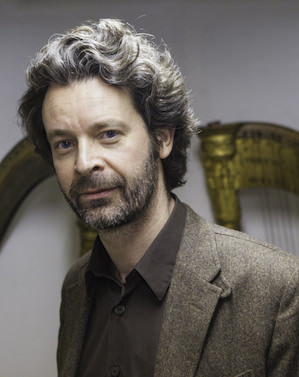 Joël Garnier perceived that it would be even more interesting if it were possible to combine the natural acoustic harp sound with the power and precision of an electronic one. The Camac technicians duly installed the Electroharp’s pick-up system on a concert harp soundboard. The result was simply extraordinary, surpassing all expectations. Unplugged, the harp is an entirely traditional instrument. But when connected to an amplification system, the palette of musical possibilities extends into infinity, from a discreet bolstering of the sound to the wildest sonic experiences. The electroacoustic pedal harp was launched at the World Harp Congress in Paris in 1990. It was particularly unmissable because it was bright blue! This is why, to this day, Camac’s electric and electroacoustic range is called the Blue Harps. Camac’s New Generation instruments were entirely reconceived by Joël Garnier and Jakez François. The aim was to deliver an instrument with a fine sound, coupled with the greatest ease of playing. The research necessary in realising these goals also led to the development of particularly accurate intonation, and a smooth, quiet and easy-to-regulate mechanism. Moreover, the use of carbon fibre for the column improved structural strength and stability. The first New Generation harps (Clio, Athena and Atlantide Prestige) were launched at the World Harp Congress in Tacoma in 1996. In 1999, the Prague WHC welcomed two Concert Grand harps to the range (the Trianon, and the Oriane). September 11 2000: Joël Garnier dies. Jakez François became President of Camac Harps. Eric Piron joins as Commercial Director. At the same time, Eric Piron joined Camac Harps as Commercial Director. He has played a large part in the development of Camac. The company has become increasingly unified, and the range of instruments has been progressively recast. It brings together the principle of systematic innovation inherited from Joël Garnier with the musical exactitude of Jakez François. 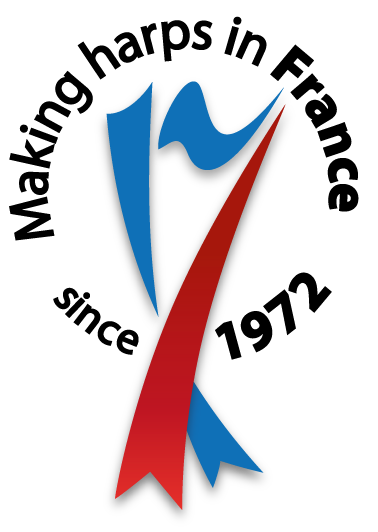 The ‘Company of Living Heritage’ award is a mark of recognition from the French Government. It is for companies who have achieved excellence in the fields of craftsmanship and manufacture, and who thereby underpin the economic and cultural identity of France. To this day, Camac are proud to continue to make harps entirely in France.